Understanding what your colleagues or customers value can be a game changer in sustainability. To do this, it helps to know the ‘rules of the behaviour change game'. If a fact is inconsistent with our prior beliefs, we're unlikely to accept it - it's as simple as that. So how can you break through? Luckily, the research has been done! 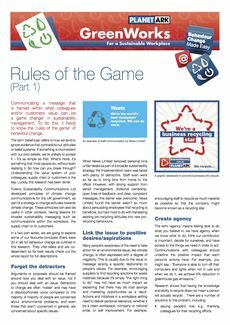 Futerra Sustainability Communications Ltd has developed the key principles of climate change communications. 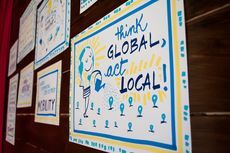 These principles can also be useful in a broader sustainability context, such as communications within the workplace, through the supply chain, or to customers. In a two part series, we are going to explore some of our favourite of these principles (there were 20 in all). They inter-relate and are codependent so for best results, check out the whole report for full descriptions. Arguments or proposals should be framed around how you deal with an issue, not if you should deal with an issue. Detractors to change are often ‘noisier' and may have a disproportionate voice compared to the majority. A majority of people are concerned about environmental problems, and even those that aren't concerned in general, are concerned about specific issues. When News Limited removed personal bins under desks as part of a broader sustainability strategy, the implementation team was faced with plenty of detractors. Staff even went so far as to bring bins from home to the office! However, with strong support from senior management, divisional ownership, open lines of feedback, and clear, consistent messages, this barrier was overcome. News Limited found the barrier wasn't so much about persuading employees that recycling is beneficial, but had more to do with translating existing pro-recycling attitudes into new pro-recycling behaviours. Many people's awareness of the need to take action for an environmental issue, like climate change, is often expressed with a degree of negativity. This is usually due to the issue or message lacking a specific relationship to people's values. For example, encouraging suppliers to find recycling solutions for waste materials because it's simply "the right thing to do" may not have as much impact as explaining that there may be cost savings and marketing opportunities as a result. Actions and initiatives in a workplace setting need to deliver personal relevance, whether it be a clean workspace, company or national pride, or self improvement. For example, encouraging staff to recycle as much material as possible so that the company might become known as a recycling star. The term ‘agency' means feeling able to do what you believe in; we have agency when we know what to do, think our contribution is important, decide for ourselves, and have access to the things we need in order to act. Communications with colleagues should underline the positive impact that each person's actions have. For example, you might say : "Everyone is able to turn off their computers and lights when not in use and when we do it, we achieve X% reduction in greenhouse gas emissions." Research shows that having the knowledge and ability to recycle does not mean a person will actually recycle. valuing people's role e.g. thanking colleagues for their recycling efforts. making sustainability issues personally relevant e.g. showing the energy saved for each plastic bottle recycled. giving people a sense of control e.g. using the company supplied KeepCup at the coffee shop. valuing ‘self-motivated' change e.g. asking for ideas on how to increase recycling. linking to things people CAN and WANT TO do something about e.g. a one recycling bin per floor policy gets people to stretch their legs and have a break from the computer. Many people believe sustainability is a global issue that doesn't impact them, and something they can't have an impact on. This disconnect should be faced in tandem with the work on agency (see above). Sustainability issues do have an impact on the workplace, and they can be acted upon while at work. For example, although waste management is an issue for all of society, businesses have to bear explicit financial costs for the services they use, and for the amount of waste they dispose of. 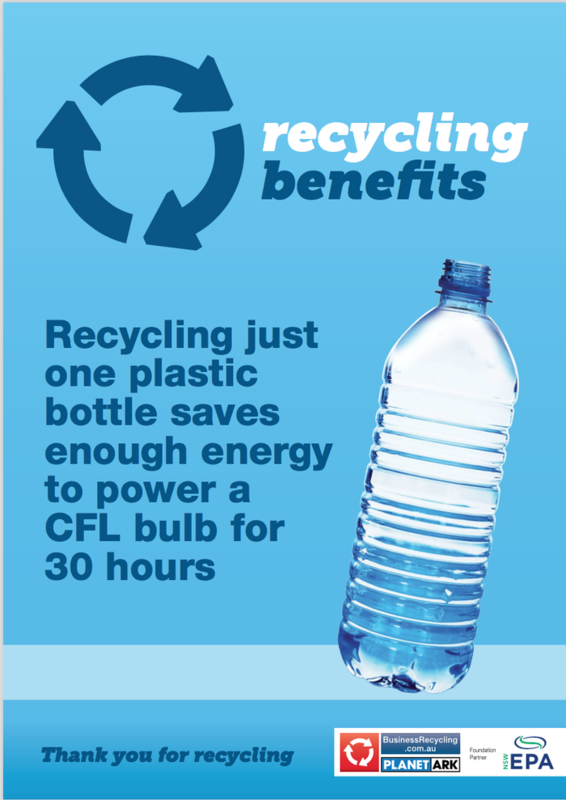 Reducing costs by finding less expensive or more effective recycling options can have significant benefits in enterprises of all sizes, and it is something all staff can act on at work. 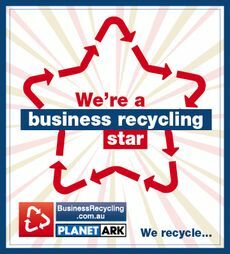 The ‘Cartridges 4 Planet Ark' program provides printable posters for workplaces with familiar faces. Information alone doesn't always change behaviour. This is where the use of emotions and visuals can play a very important role. Communications about sustainability issues should connect with people through the heart and senses rather than solely the mind. Again aspirations like national pride, self improvement or pride of workplace may help elicit a positive behaviour change. 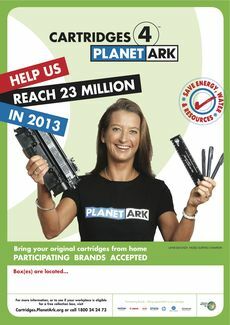 For example, recycling printer cartridges through ‘Cartridges 4 Planet Ark' might not be the most interesting subject but if it invokes workplace pride by way of a displayed certificate that outlines the amount of cartridges returned and the positive environmental impact your workplace has achieved, it can motivate staff to recycle even more. One of the key messages from Dr. John J. Medina's New York Times bestseller Brain Rules, is that ‘Vision trumps all other senses'. Hear a piece of information and three days later you will remember 10% of it. Add a picture and you'll remember 65%. So when communicating to your staff via emails, PowerPoint presentations or signage, remember to use pictures. State of NSW and Office of Environment and Heritage (2013) Who Cares about the Environment in 2012? Liked this page? Check out Behaviour Change Made Easy - Sending the Right Signs.